A1. 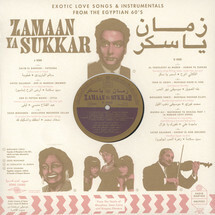 Salim El Baroudi - "Fatouma"
A2. 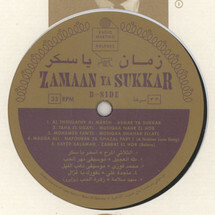 Sayed Salamah - "Ard El Marrah (Mambo)"
A3. Abd Al Fattah Mansi - "Leyla"
A4. Soad Mohamed - "Ahallefak Washkeek Lellah"
B1. Al Thourathy Al Mareh - "Asmar Ya Sukkar"
B2. Taha El Ugayl - "Musiqaa Nahr El Hob"
B3. Mohamed Fawzi - "Musiqaa Dhahab Ellayl"
B5. Sayed Salamah - "Zahrat El Hob (Bolero)"
Zamaan Ya Sukkar is a rich musical portrait from the time when Cairo was the vibrant cultural heart of the Middle East and the grandeur of the leading orchestras was incomparable. 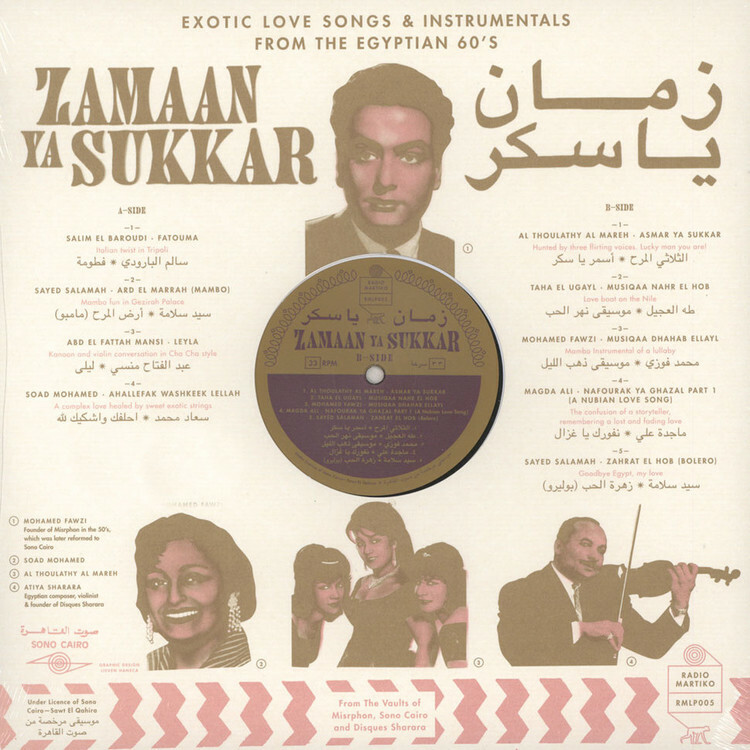 Un-earthed latin and jazz-tinged tracks will let your mind drift off to the glamorous nightlife of 60's Cairo. Meet some forgotten souls of the Egyptian music scene and cinema world. Sensual voices and Bolly-wood-like orchestra sounds inflame the senses of the body with an in-tangible exotic twist! All music is remastered from original 45's pro-duced by Sono Cairo.